Shred the chicken (you will need approx 1 ½ cups). Combine chicken, mayonnaise, carrot, celery and chives. Season and mix well. 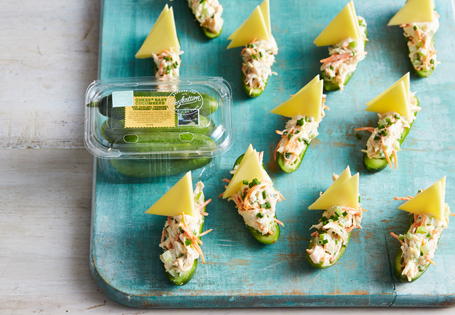 Place cucumbers cute side up on a board and spoon chicken mixture evenly among them. Cut cheese slices into 8 x equal triangles. Sandwich 2 together and stand upright in the chicken mixture, to form the sail. Repeat with remaining cheese. TIP: shave the bottom of the cucumber to create a base and stop them falling over.